Other metals can replace the copper, usually with the intention of improving various properties of the basic sterling alloy such as reducing casting porosity, eliminating fire scale, and increasing resistance to tarnish. These replacement metals include germanium, zinc and platinum, as well as a variety of other additives, including silicon and boron. A number of alloys, such as Argentine sterling silver, have appeared in recent years, formulated to lessen fire scale or to inhibit tarnish, and this has sparked heavy competition among the various manufacturers, who are rushing to make claims of having the best formulation. However, no one alloy has emerged to replace copper as the industry standard, and alloy development is a very active area. How can you tell if your silver is Sterling? Sterling made in the USA after approximately 1850 always has a sterling mark. It may literally have the word STERLING and/or say .925, or show the fraction 925/1000. 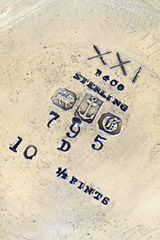 If it does not have this mark then it is likely not sterling, unless it is made outside of the United States and has other hallmarks that designate its silver content. It can also be tested with an acid to determine its content. This should only be done by a professional. The process of extracting and refining silver dates from the third millennium BC, and the metal was well represented in the wealth of Mesopotamia, Babylon, Egypt, classical Greece and ancient Rome. 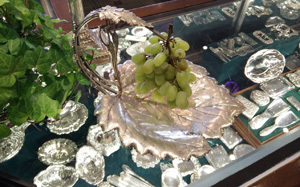 Silver's unique properties have made it a wonderful medium for the decorative arts, and its intrinsic value as a precious metal has made it the ultimate and everlasting recyclable. As fashion changed over the decades and centuries, silver has been melted and reshaped into new forms, and in times of economic crisis, for individuals and nations, it has been converted into coin. Its reflective qualities have made it an ideal material for the display of power, wealth or reverence, in palaces, cathedrals, temples and the great houses of Asia, Europe and the Americas. It was during the Renaissance that silver began to become important for display: An impressive show of silver objects was a telling measure of a person's wealth and social standing. In the English court, New Year's gifts of silver were customarily exchanged, and silver was of foremost importance for state occasions. At the same time, silver was the preferred material for the wealthiest aristocratic and merchant classes. The social, rather than the economic, aspects of silver were taking shape. Etruscan spoons dating from 700 BC are not unlike the ones we use today, and knives were always present at the table, but it was in 16th century Italy that forks began to replace fingers for conveying food to the mouth. As the fork's popularity spread to France, great changes in manners began. Foods that had previously been eaten by dipping fingers or bread into a common bowl came to be eaten with spoons and forks from individual plates, and by the late 1600's there existed different plates for different foods. Further, individual chairs replaced benches at the table. This revolution, of sorts, greatly affected the silversmiths' output, and before the close of the 17th century silversmiths found themselves making large matching services for their wealthy patrons. It was the beginning of table silver as we know it today. 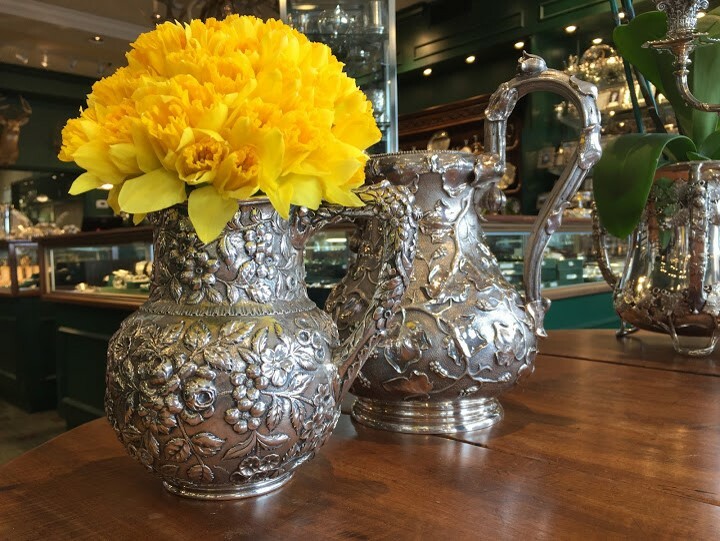 In the 18th century silver more and more became the tangible evidence of wealth, and men and women carried their hard-earned and carefully hoarded coins to the silversmith to be made into usable objects. 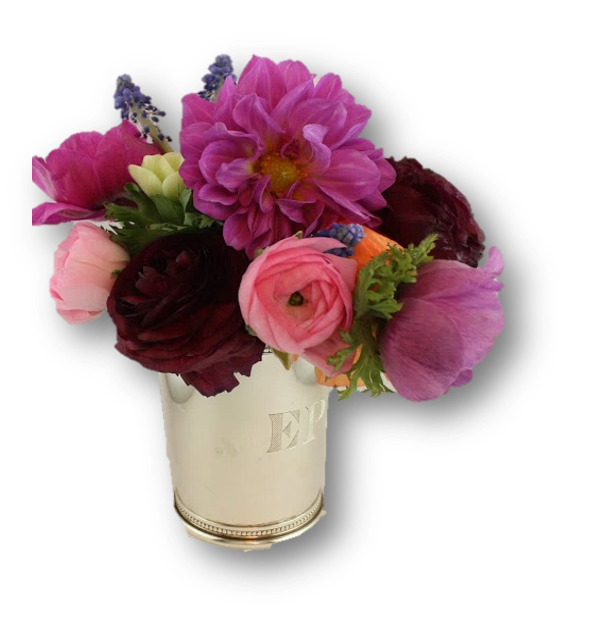 These pieces retained their intrinsic value while being used for celebrations, daily routines or mere display. It is from the American colonies that we get the term American Coin Silver. Although this phrase is commonly linked to simple pointed-end, round-end or fiddle-back spoons, early American silversmiths were, like their English and European counterparts, producing church silver, tankards, beakers, tea sets and tea caddies, trays and salvers, porringers, braziers, candlesticks, etc. The word coin as it pertains to these articles of American silver mainly defines the source of the raw material: Until the 19th century, coins provided the silver makers of nearly all countries with raw material when bullion was scarce, but since silver was not mined commercially in the United States until the 1850's, coins were the American silversmith's major resource. 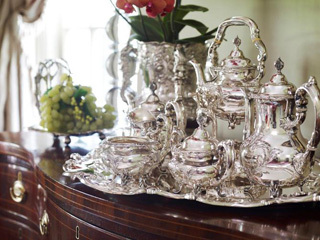 At the beginning of the 19th century, silver services were comparatively simple. However, rising middle and merchant classes on both sides of the Atlantic, as well rich industrialists in the United States, created a great demand for silver objects. The urge to display affluence, along with impetus given by exhibitions in 1851 and 1862, led not only to more ornate styles but a wide range of new serving and individual pieces. This Victorian explosion of tableware seems to have begun simply enough, with the fashion for separate fish knives. Followed, of course by the addition of the fish fork. By the 1870's, dinner consisted of from five to eighteen courses, and, as one etiquette book stated, the guest could expect "a bewildering array of glass goblets, wine and champagne glasses, numerous forks, knives and spoons." Nineteenth-century silver manufacturers had placed great emphasis on industrialization and modern manufacturing techniques, but the early years of the 20th century saw a move to widen the gulf between artist and industrialist. The Arts & Crafts Movement, which saw its beginnings in Europe and spread quickly across the Atlantic, put emphasis on the individual craftsman. The movement saw the important role that craft can play in the "humanizing" of society. The workers in this tradition have aspired to lofty goals, taking the silversmith back to role of artisan. The period between the World Wars brought about great stylistic changes, with the introduction of "Modernism", later termed the "Art Deco" style. As we begin the 21st century, these objects too are finding their place in museums and private collections. MEXICAN SILVER This is the name given to the silver used by many Mexican and American Indians Craftsmen. Its silver content is generally above 90%. SILVER PLATED Made by electroplating fine silver on base metal alloy-usually nickel silver or Britannia metal, sometimes brass or copper. This was perfected for industrial purposes in the mid 1800's. Electroplating is the process of using electrical current to coat an electrically conductive object with a relatively thin layer of metal. SHEFFIELD PLATE Originally was made by bonding sheet silver to copper, the rolling and manufacturing into hollowware. The original process was abandoned in the mid nineteenth century due to the introduction of electroplating. Imitations are made by electroplating silver on copper and are sometime mis-advertised as Sheffield plate. 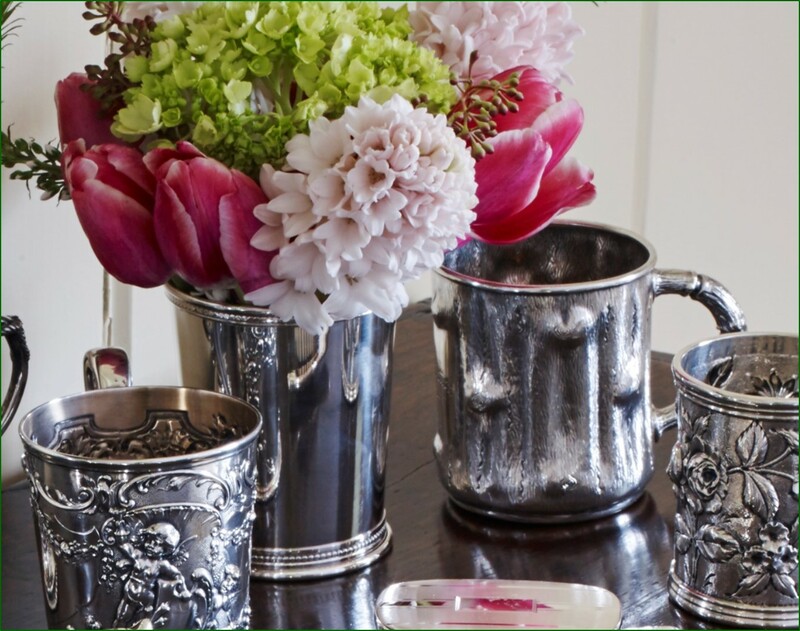 Sterling silver use is not just limited to a formal dinner or a fancy gathering. There is no need to be afraid of your silver, so go ahead and take it out of hiding. You could and should use your sterling every day! Sterling is both attractive and functional, adding a touch of elegance to your day to day living. Sterling can be used for all occasions, and is recommended to be used daily. 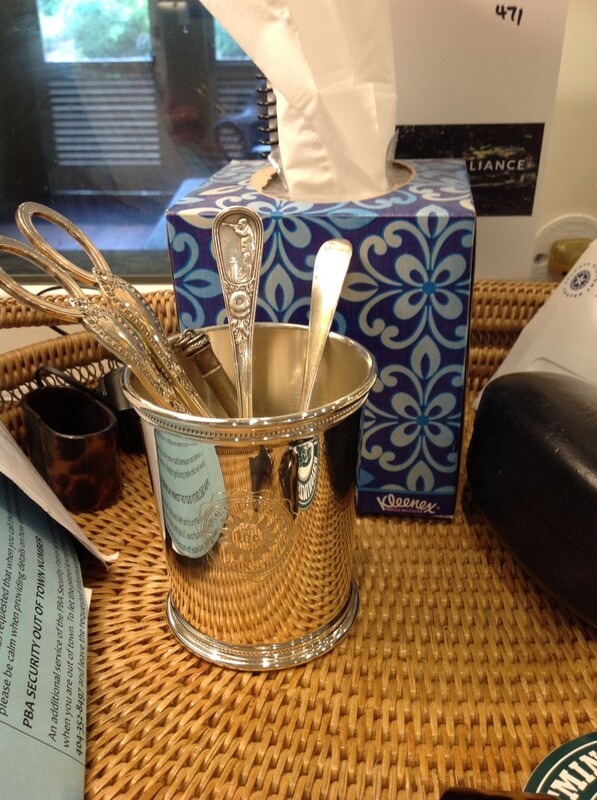 Sterling silver flatware is dishwasher safe (if manufactured after 1950) and easy to keep clean. 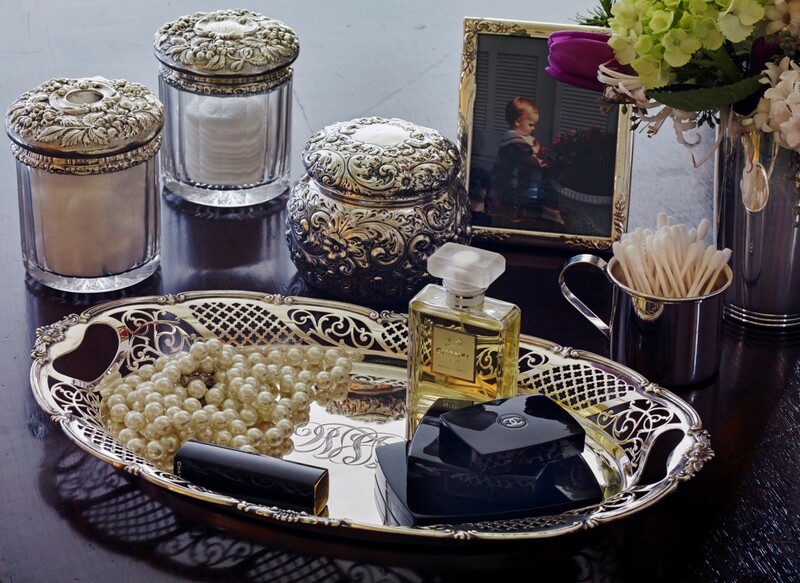 Everyday use keeps the silver shiny and tarnish-free. 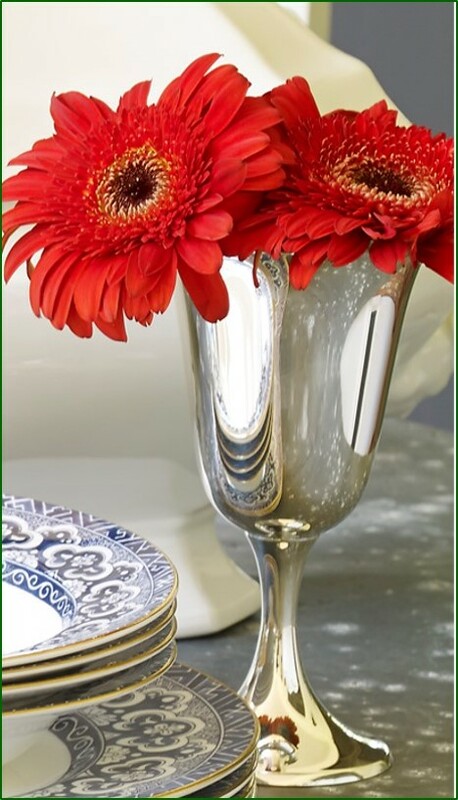 Sterling can be used anywhere in the house, and not just for display. 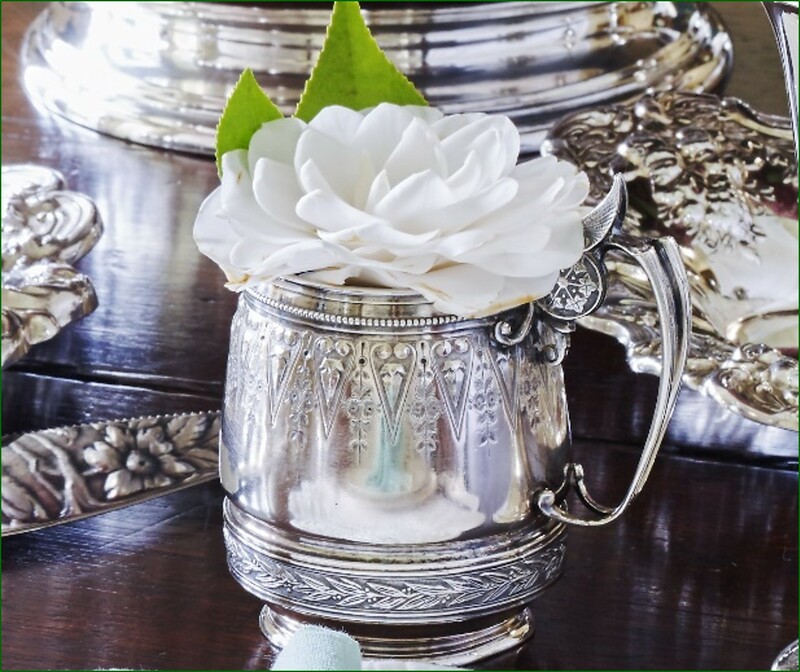 Use your silver for functional purposes--- from dresser jars, pin trays and sterling cups in the bathroom, to sterling vases, boxes, candlesticks, and bowls in the living/dining room. 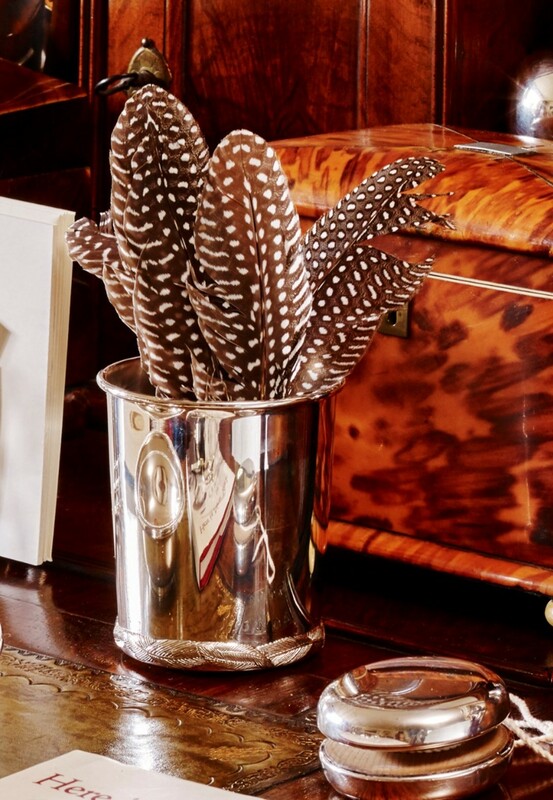 Adding a touch of silver can make any room sparkle. You can add a simple yet sophisticated detail to any dinner or room thanks to sterling's versatility. In the South, there is a time-honored tradition that is best enjoyed under the very wide brim of an elaborately decorated hat: The Kentucky Derby. 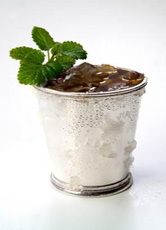 As you watch the majestic thoroughbreds race round the track, there is no better way to cool yourself off than with a refreshing Mint Julep, better yet served in a sterling silver julep cup. The sweet bite of bourbon mixed with the fresh mint and all served ice cold is the perfect palate quencher to tackle that deep south heat. As the official libation of the Derby, one must familiarize themselves with its sweet southern charms. 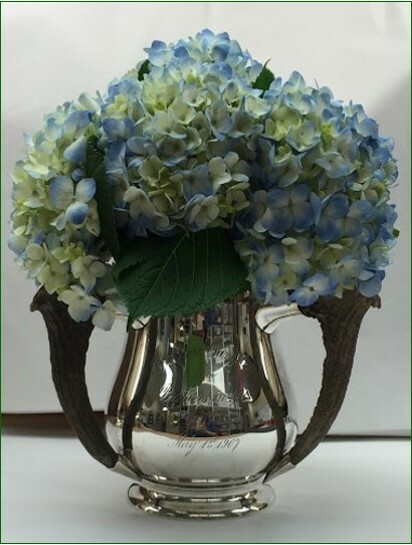 The sterling water pitcher acts as a beautiful serving piece for your dinner table, yet can also serve as a modernly chic flower vase in your living area. Use your sterling every day at every meal. 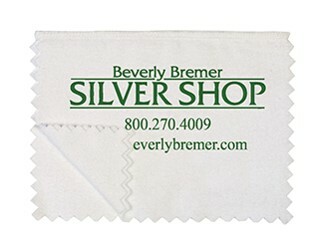 Frequently used silver requires the least amount of care and special attention. Daily use is the best way to keep sterling bright and shiny. Don't save it for a special occasion. The finish of sterling silver actually improves with daily use, so enjoy using it regularly! With constant use, washing and handling, silver will develop tiny surface scratches (which are bound to occur) that give silver a "patina". This patina is characteristic of cherished old silverware. Rotate the use of all your pieces to create an even "patina" throughout your set. Washing silver immediately after use helps prevent tarnish. Tarnish is caused by sulfides from food, contact with rubber or smoke and gas in the air. If food is left on silver for periods as short as one hour, it can stain sterling. Be especially wary of foods such as mayonnaise, vinegar, and eggs. If you cannot wash your sterling immediately after use, rinse it thoroughly, but do not leave to soak. 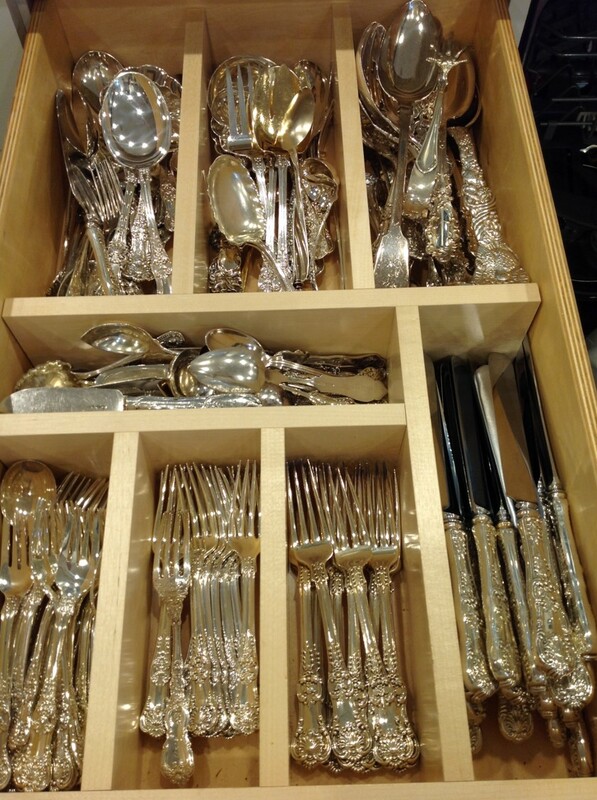 Most sterling flatware, except for knives, may be placed in the dishwasher. For best results, remove flatware before the drying cycle begins and dry throughout with a soft, cotton cloth. 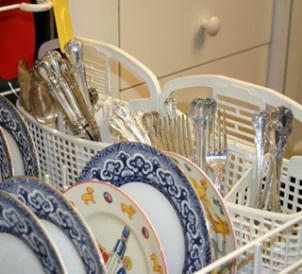 When you use the dishwasher for cleaning, use a mild, non-citrus detergent, do not overcrowd the flatware baskets, and take care not to place sterling in direct contact with stainless steel. Do not dry on a high heat cycle. If washing by hand, put a rubber mat or dishtowel in the bottom of the sink to prevent contact between the silver and any metals that are a part of the sink. Use a soft cloth, mild detergent, and hot water to clean silver. Avoid all citrus detergents as they can cause rust spots on silver handles and blades. Never use abrasive pads or steel wool to remove debris. Dry silver immediately after washing with a soft cloth to prevent water spots. Avoid placing silver on hot surfaces such as heating elements, or near open flames. The blades of sterling silver place knives are made of a harden-able grade of stainless steel. This grade of stainless, while resistant to most foods or chemicals in the home, is subject to pitting under certain conditions. The conditions that most commonly cause pitting are long contact with chloride-containing foods such as salt, salad dressing, etc. OR soaking in water. Prolonged soaking (i.e. overnight) in water must be avoided especially where several pieces may be in close contact during the soaking period. The "rinse and hold" cycle on an automatic dishwasher is particularly hard on cutlery because the pieces are warm and wet for an extended period of time. Best care for your cutlery is to wash and dry as soon as practical after using, either by hand or on a fast cycle in the dishwasher. 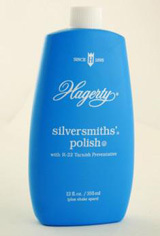 For occasional beauty treatments, use a polish that is specified for sterling. Before beginning, wash pieces per recommendations above to clean off all debris. For example- if you are trying to remove candle wax from candlesticks- simply run the soiled area under hot water. Remove wax with your fingers, and avoid using knife blades to remove wax. Dry each piece thoroughly before you begin to polish. 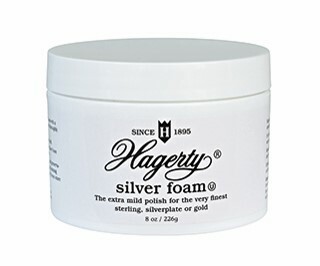 Apply a top grade silver polish in a gentle, circular motion, using a soft cloth or sponge. Avoid using "dip" polish and electrolytic cleaners as they contain harsh chemicals. Also we do not recommend the home remedy of baking soda and tin foil. 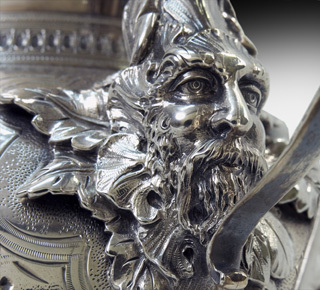 We offer professional sterling silver polishing services. Keep your silver in a clean, dry place. For silver in daily use storage in a lined chest or drawer is sufficient protection. For pieces not in daily use, tarnish resistant flannels are recommended. Do not wrap silver in plastic food wrap or use rubber bands to secure the silver as plastic wrap and rubber bands can permanently bond to and discolor sterling silver. The same is true for salt when allowed to remain in contact with sterling. So remove salt from salt cellars and shakers between uses. Whether you are throwing a formal dinner party or inviting friends over for a cozy meal, proper tablesetting can be an entertaining nightmare! 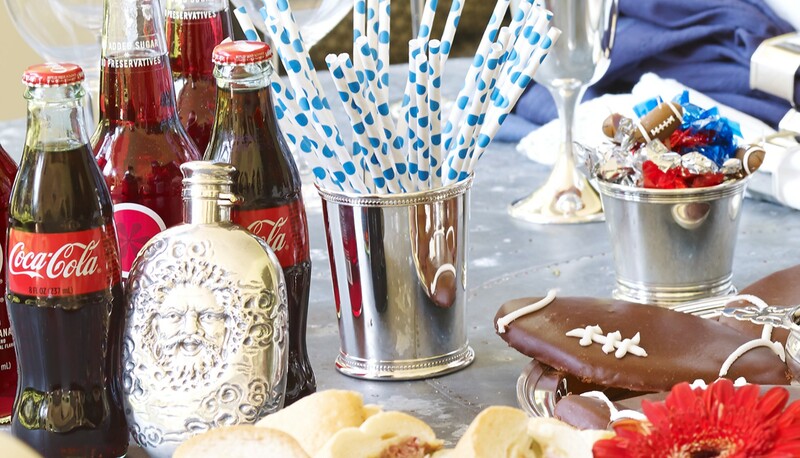 With over 100 flatware serving pieces to choose from, it's hard to know where to begin! 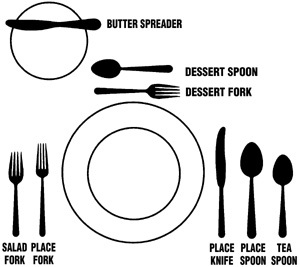 Helpful tip: Always start with the basic 5-pc place setting: teaspoon, place spoon, salad fork, place fork and place knife. Then, build from there. With fine sterling, acquiring the total number of 5-pc sets you desire may take time. 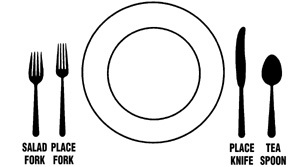 Begin with four place settings and then build up to eight place settings, which is the most popular configuration. 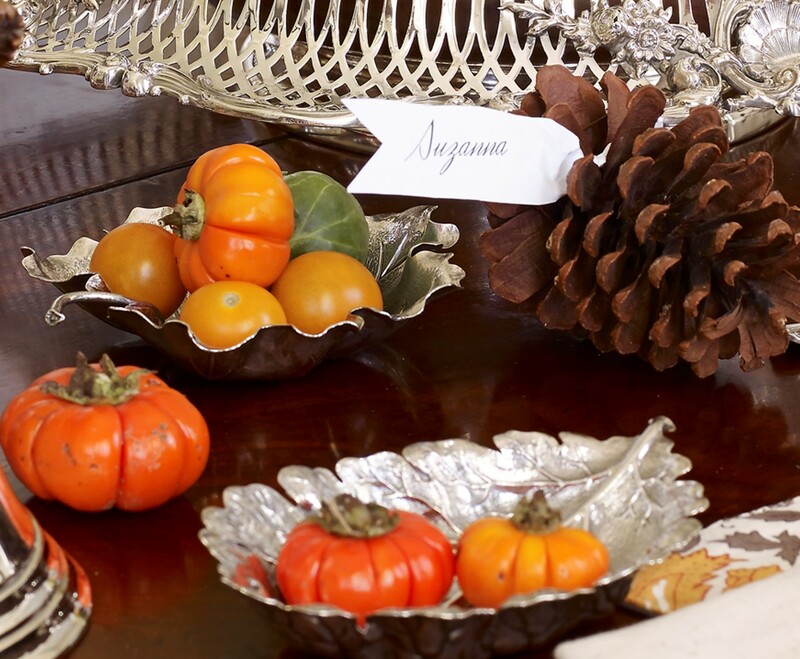 Don't just wait until holiday gatherings to use your sterling. Any time is a good time to use silver! 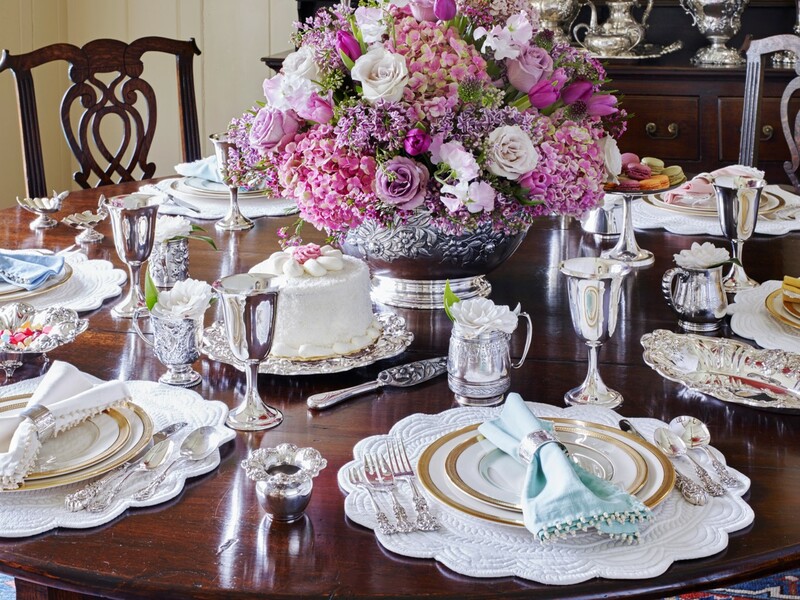 Remember, a well laid table says "welcome" to both family members and guests. 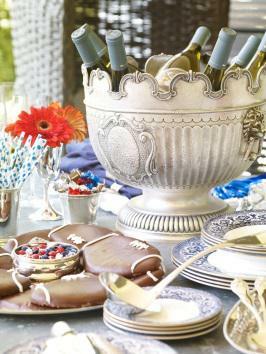 Today's entertaining has no limits and few boundaries ... so have some fun while entertaining. 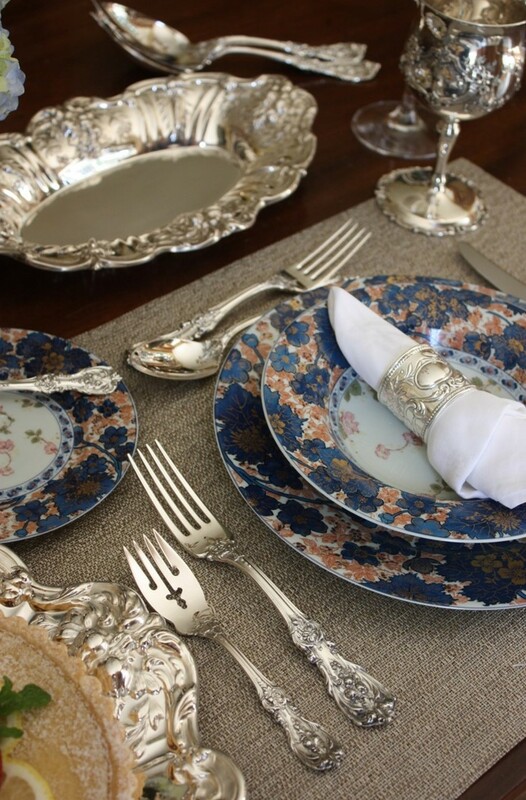 Pair a traditional pattern with china or a modern design with ornate dinnerware. You're serving Mac-n-cheese with your sterling silver?! Why not! Setting a pleasant informal table and serving food graciously can make even the simplest meal a fabulous experience! Find out more on how to create a dining experience that will make even hotdogs look good. The basic serving pieces include table spoons, butter knives, serving forks, gravy ladles, and sugar spoons. 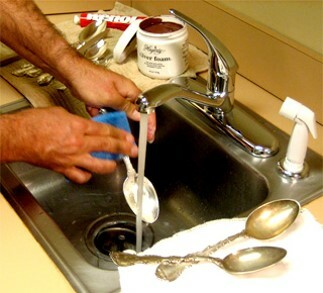 And because we've all been know to accidentally drop a flatware item in the garbage disposal, some individuals choose to collect two of each serving piece. Once you are all set with the basics, you can move onto buying the really fun-to-own serving accessories like cracker scoops and hooded asparagus servers! Looking for that special piece to complete your collection? Start shopping below or simply contact one of our sterling silver experts. To find answers to the most commonly asked sterling and coin silver questions, visit our Frequently Asked Questions (FAQ) page.